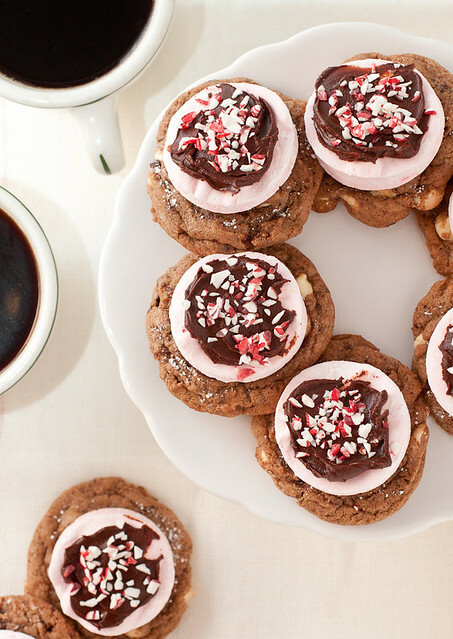 At this time of year, I need nothing more than a warmly lit Christmas tree, some long-sought after decorations, a snowy day, and some of these hot chocolate cookies. Oh sure, hot chocolate loaded with marshmallows by itself is fine and dandy but it’s Christmastime! Bring on the cookies! Aside from my determination to conquer the homemade marshmallow this winter, I was equally as determined to make a killer hot chocolate cookie to nestle itself underneath one of those marshmallows. I’ve been intrigued about these cookies for the past couple of years but I wasn’t really interested in using hot chocolate packets in a cookie recipe. So I made my own hot chocolate mix. It’s what I like to do. What can I say? I actually only made a half-recipe of the mix this time around and ended up with enough for 3 test rounds of these cookies (which included two major fails) and plenty leftover to serve out of the crock pot at our family holiday party this weekend. The cookies themselves are just how I want my cookies to be: chewy on the inside with a slight crisp on the outside. They don’t blow you away with chocolate flavor but you definitely feel like you’re eating hot chocolate. (Is that weird?) Oh, and then they’re topped with a fresh and fluffy peppermint marshmallow, some rich ganache, and a sprinkle of crushed up peppermint crunch. Winter heaven wrapped up in these cookies, my friends, winter heaven. I could settle in front of the fire with a plate of these cookies and you may need to roll me out of the house when I go back to work after the New Year. It’s going to be a rough holiday season on my hips but dang it, these hot chocolate cookies are worth every single calorie. And now it’s giveaway time!! As part of my favorite things holiday giveaway series this year, I’ve teamed up with my friends at King Arthur Flour to bring you this awesome baker’s giveaway! 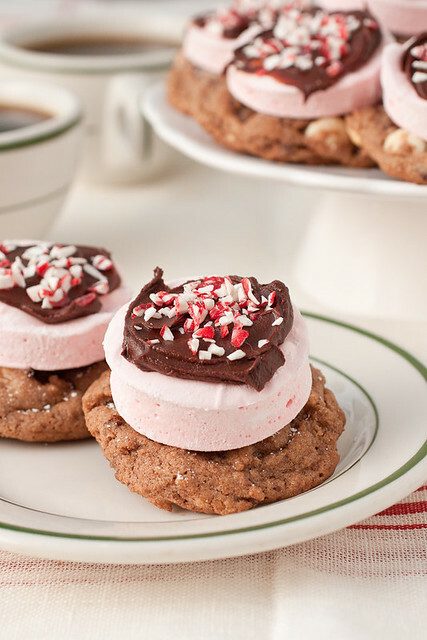 Included in this giveaway are many of the specialty ingredients you’ll need to make these hot chocolate cookies – including ingredients to make your own hot chocolate mix and peppermint marshmallows! Guys, I’m so so excited about this one! KAF sent me a bunch of stuff to use as ingredients for my cookie creation here and they are giving one lucky winner everything they sent me plus a bonus gift card! This is definitely one of my favorite giveaways yet! A $25 gift card + special ingredients?! Entry #1 (mandatory): Answer this question in the comment section of this post (and only this post): What are you most looking forward to this Christmas? Entry #2: Follow King Arthur Flour on Facebook. Come back here and post a comment in this post to let me know you did this. Entry #3: Add the Smells Like Home feed to your feed reader (like Feedly or Bloglovin). Come back here and post a comment in this post to let me know you did this. Entry #4: Subscribe to Smells Like Home email updates (only my blog posts sent directly to your inbox – no spam!). Either enter your email under Subscribe in the box up the page then leave a comment to tell me you subscribed or leave a comment here to ask me to manually subscribe you with the email address you leave in the comment form. Up to 4 entries per person will be accepted and you MUST include a valid email address in the comment form with each comment you leave. If you don’t see your comment(s) post right away, please don’t post a duplicate/repeat comment. The delay happens because I moderate all comments and your comment(s) will show up when I moderate them. Giveaway closes on Saturday, December 21, 2013 at 11:59pm Eastern and one winner will be randomly chosen. The winner will notified on Sunday, December 22nd. If the winner does not respond to my email within 48 hours, another winner will be chosen (also at random). Giveaway is open to entries U.S. mailing addresses only. Hot Chocolate Cookies + a giveaway! If you're not totally into going crazy and making everything from scratch, no worries. You could use 6 packets of store-bought hot chocolate mix and large marshmallows cut in half in place of the homemade mix and marshmallows I suggest below. I really do encourage you to at least try to make your own marshmallows if you have a few extra minutes (that's all the hands-on time they require) because they make an enormous difference and taste waaaay better than store-bought. Plus? Where can you buy peppermint marshmallows in a grocery store? To note, the prep time listed here includes just making the cookies and the assembly time - I had the mix and marshmallows made a couple days in advance in order to save time when I made/assembled the cookies. To make the cookies: Preheat oven to 350° F. Line two baking sheets with parchment paper; set aside. Whisk the flour, hot chocolate mix, baking soda, baking powder, and salt together in a medium bowl; set aside. In the bowl of a stand mixer fitted with the paddle attachment (or a large bowl with a hand mixer), beat the butter and sugar together on medium speed until combined, 30 seconds to 1 minute - no need to beat until light and fluffy here as that is too long for these cookies. Beat in the egg, yolk, and vanilla; scrape down the sides of the bowl. Pour in the dry ingredients and mix on low speed just until no flour remains. Stir the white chocolate chips into the batter on low speed or by hand. With a medium cookie scoop (about 2 tablespoons), scoop out the dough into rounds and space the rounds 2 inches apart on the baking sheets. You should get about 20-22 cookies from the recipe. Bake for 10-12 minutes; rotate the pans front to back and top to bottom halfway through the baking time. Cool the sheets on wire racks for 5 minutes then transfer the cookies to the racks to cool completely. To assemble the cookies: Heat the chocolate and heavy cream in a microwave-safe bowl in the microwave for 30 second intervals at half power until the chocolate is melted and the cream is fully incorporated, stirring between each interval. The ganache should be thick but spreadable. Spread a quarter-size dollop of ganache on the top center of a cookie and lightly press a marshmallow round on top - it will stick when the ganache hardens. Spread a little more ganache on top of the marshmallow and sprinkle some peppermint crunch on top of the ganache. Repeat with remaining cookies. Store assembled cookies in an airtight container for up to 5 days. Note: If you’re not totally into going crazy and making everything from scratch, no worries. You could use 6 packets of store-bought hot chocolate mix and large marshmallows cut in half in place of the homemade mix and marshmallows I suggest below. I really do encourage you to at least try to make your own marshmallows if you have a few extra minutes (that’s all the hands-on time they require) because they make an enormous difference and taste waaaay better than store-bought. Plus? Where can you buy peppermint marshmallows in a grocery store? To note, the prep time listed here includes just making the cookies and the assembly time – I had the mix and marshmallows made a couple days in advance in order to save time when I made/assembled the cookies. In the bowl of a stand mixer fitted with the paddle attachment (or a large bowl with a hand mixer), beat the butter and sugar together on medium speed until combined, 30 seconds to 1 minute – no need to beat until light and fluffy here as that is too long for these cookies. Beat in the egg, yolk, and vanilla; scrape down the sides of the bowl. Pour in the dry ingredients and mix on low speed just until no flour remains. Stir the white chocolate chips into the batter on low speed or by hand. Spread a quarter-size dollop of ganache on the top center of a cookie and lightly press a marshmallow round on top – it will stick when the ganache hardens. Spread a little more ganache on top of the marshmallow and sprinkle some peppermint crunch on top of the ganache. Repeat with remaining cookies. Store assembled cookies in an airtight container for up to 5 days. 1–lovelovelove these cookies, esp. that you made homemade hot cocoa mix for them! I am most looking forward to taking time of work and spending time with family on Christmas Eve and Christmas Day. I added the Smells Like Home feed to AOL Reader. I’m really looking forward to Christmas Eve dinner at my parents house and just enjoying the company of my family. Thank you and Merry Christmas to you and yours! I subscribe via Feedly. Thanks! I am looking forward to spending time with my husband’s family. I subscribe via Feedly and Bloglovin. I am looking forward to not getting any presents so I can spend my Christmas day watching my nephews open their presents. I hope I can just sit in a chair by the fire with a mug of hot cocoa and watch them go nuts with their new toys and not have to . I subscribe to the feed via NewsBlur and I would like so subscribe to emails at parrottalkback at gmail dot com. I’m looking forward to seeing my kids’ faces while they’re opening their presents! I’m already a King Arthur follower on Facebook. I’m looking forward to seeing my daughter open her presents on Christmas! I’m looking forward to having some down time!! I have you in my feed on The Old Reader. Watching the magic of Christmas through the eyes of my three children. The thing I am most looking forward to is my brother and grandmother coming into town and some long games of Hand & Foot (a family card game tradition). My daughter is 2 this year, and this is the first Christmas she’s really been excited about, so I am looking forward to her opening her stocking and gifts on Christmas morning! I’m looking forward to visiting with my entended family! i am most looking forward to speding time with both of my families as well as my friend-family this holiday season. i LOVE giving gifts and pumping people full of delicious food. i added smells like home to my blog lovin! To spend it with my cousin from Charleston! I am looking forward to opening presents. I look forward to seeing family I haven’t seen in months. I subscribe to Smells Like Home via Feedly. I’m looking forward to hosting my very first Christmas. I have always traveled for Christmas, even as a kid. This year, my in-laws are coming to our place in NYC. I am most looking forward to sharing all the yummy baked goods! This Christmas I’m most looking forward to my husband having some time off work and spending quality time with him! I added the Smells Like Home feed to bloglovin’. I’m already subscribed to Smells Like Home email updates. I’m looking forward to time off work and doing whatever I want: sleeping in, making special flavored coffee in my percolator, reading, baking, whatever strikes me! Hi, I already subscribe to your email updates. I am looking forward to the Holiday, because my brother, will be here to visit with my family, and my sister. My sister and I haven’t seen our brother in 12 years, so I am very excited to have him with us, on the special day, of Christmas. Merry Christmas, to you and yours. I can’t wait to drive around looking at Christmas lights with my kids…one of my favorite things to do at the holidays!!! I also subscribed to your email updates. Merry Christmas!!! I’m looking forward to 3 full days of uninterrupted family time! I already follow you on my reader. I’m excited to go back home and see my family. We live too far away now! I’m also a KAF Facebook fan. I am looking forward to making new memories with my toddlers as they participate in our family traditions! what a fun giveaway! I’m looking forward to spending time with my out-of-state family. happy holidays to all! I’m looking forward to baking yummy treats with my daughter. She loves to help me in the kitchen and I love all the memories we are making together! I’m most looking forward to seeing some friends while we travel! I’m looking forward to spending time with my kids! I am looking most forward to sharing my homemade Twix bars with everyone (I will be using King Arthur’s recipe and also trying two others), and eating everyone else’s Christmas goodies. I would love to win this giveaway! Looking forward to time off work and seeing friends and family. Thanks for the giveaway and have a wonderful Christmas! I subscribe to Smells Like Home through Feedly. I am most looking forward to our Christmas Eve brunch with family and friends. I follow KA on Facebook. I follow Smells Like Home on Bloglovin’. I am an email subscriber to Smells Like Home! i have Smells like home on my feedly! I look forward to warm nights by the fireplace with my hubs. I looking forward to spending time with my family. I added the Smells Like Home feed to my Bloglovin feed. I’m looking forward to having all of our family over on Christmas Day for a yummy dinner. I follow King Arthur Flour on Facebook. (FB name: Madeline Brubaker). I’m looking forward to seeing everyone open the gifts I bought for them!! Looking forward to spending time with family. I’m looking forward seeing how happy the kids are when they open their gifts. I follow Smells like home on bloglovin. I look forward to spending time with family! I like KAF on FB!